So what could be the permanent or environment-friendly solution to this? The answer is the ‘Eco-friendly Ganesh’. Why has the need for an Eco-friendly Ganesh idol arisen today? In earlier times, these idols were made of biodegradable substances such as wood or soil. However, today these – are made using Plaster of Paris (PoP) and synthetic colours, which are toxic to human and do not break down easily in water. The remnants of the idols that are found lying undissolved prove harmful to the environment. The chemical substances used too, make the water increasingly acidic endangering the marine ecology of the water bodies. Moreover, if such water is used in daily life, it makes human susceptible to diseases. 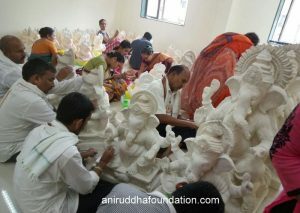 To avoid these ill-effects and safeguard the environment, Shree Aniruddha Upasana Foundation along with its sister organisations initiated the project of making eco-friendly Ganesh idols. These idols completely dissolve in water further preventing the spread of harmful effects. 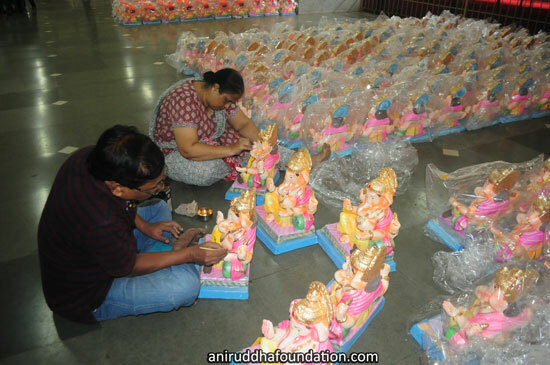 Since 2005, the eco-friendly Ganesh idols are being made by ‘Aniruddha’s Universal Bank of Ramnaam’ and ‘Aniruddha’s Aadesh Pathak’, under the guidance of Sadguru Aniruddha. 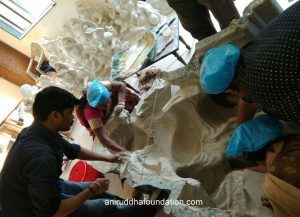 The paper pulp from the Ramnaam books, which are written and deposited by Shraddhavans from all over is used to prepare these idols. Every paper that goes in the making has the ‘Ram Naam’ inked on it. The pages of Ramnaam books are soaked in water and converted into paper pulp. This pulp thus obtained is mixed with white ink and tree-based gum. This mixture is kneaded uniformly and is placed on the mould to give it an appropriate shape and form of an idol. Once dried, it is coloured using food-based dyes. These idols, on immersion, completely disintegrate in water and do not pollute the ecosystem. Moreover, ‘Shree Aniruddha Upasana Foundation’ did have the opportunity to patent this novel method of producing an eco-friendly idol. However, the organization refused to do so, keeping it open to let the people also contribute to the environment. With each passing year, the response to this initiative is overwhelming. In 2005, 335 idols were produced, which increased to 3000. Today the number ranges from 6000 to 7000 annually. In 2017, around 6500 such idols were installed at various households. 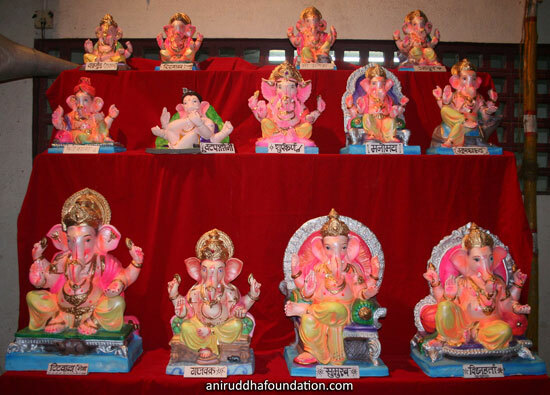 These idols have not only been popular in India, but the devotees in the United States, Canada, Australia, New Zealand, South Africa, Sri Lanka and the Middle East have also carried them home to worship and pray. A ‘Letter of Appreciation’ was awarded for three consecutive years from 2010 to 2012 by the Municipal Corporation of Greater Mumbai (or MBMC) under its ‘Go Green Campaign’ and ‘Environment-Friendly Ganpati’ initiatives. Awarded the ‘Times Special Green Ganpati Award’ in 2009 by the Maharashtra Pollution Control Board, Mumbai Mirror Association and Times Red Cell. Felicitated in 2008 by the Mayor of Mumbai, Dr Shubha Raul, at an exhibition organized at the National Institute for Training in Industrial Engineering (NITIE) in Powai. In this way, men and women of all ages selflessly participate in this activity with enthusiasm. 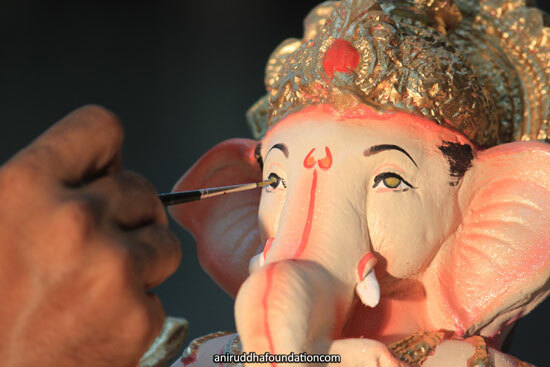 It is essential to celebrate the Ganesh Festival in a green manner to save our environment, and it is with this motto that Shree Aniruddha Upasana Foundation has begun making eco-friendly Ganesh idols. If the project seeks participation from all Ganesh devotees, the damage can be avoided to a more significant extent.